Kitchen is the room with a special microclimate. 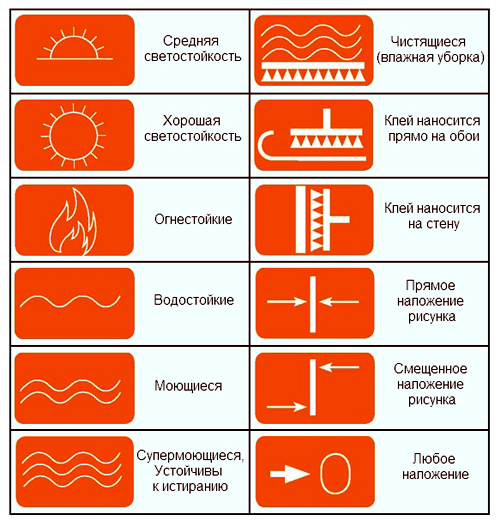 Temperature extremes, moisture and steam, smoke, smells of food being prepared... So choose the Wallpaper for kitchen walls need taking into account all these factors – otherwise, even a perfect repair will soon lose. Water resistance is especially important if the Wallpaper will be glued in the working areas of the kitchen where the walls will get fat, splashes from the mixer and so on. In this case, the Wallpaper should be resistant to mechanical abrasion and exposure to detergents. Manufacturers label these washable Wallpaper with a special icon or three waves and brush. If the Wallpaper is glued only in the dining area, you can choose waterproof Wallpaper marked in two or three waves that you can periodically wipe with a damp sponge. The light fastness of Wallpaper for the kitchen should also be high. Typically, kitchens are designed and equipped so that they got as much light as possible. So the Wallpaper in these areas, not shaded, blackout curtains, fade and turn yellow, usually faster than in the rooms or corridors. The density of the Wallpaper, and their resistance to mechanical stress is another indicator that strongly influence the durability of the repair. It is possible to identify by touch, tapping with your fingers on the roll. If the surface flexes, springy, crease – then the material of the Wallpaper is porous, it will accumulate dirt, it's too easy to be accidentally scratched, in the end wall very quickly lose the form. In addition, loose porous Wallpaper can absorb the odors that food is also a big minus. If the Wallpaper is put in the working area, next to the stove or locations of appliances, they must also be fire resistant. Manufacturers label these Wallpapers are an icon of flame. Choosing finishing materials for the kitchen, some Wallpapers need to be put in the "stop list" even if they are 100% conform to your ideas about the ideal design of the room and you really like the colors. What is that Wallpaper? A very inexpensive option that when choosing Wallpaper for the kitchen seduces many of its "efficiency". In fact, the economy here is not: they are extremely impractical, so will last very long. They cannot be washed, they do not like moisture and does not tolerate mechanical stress very quickly absorb odors. All versions of acrylic Wallpaper with textured surface (corrugated, embossed with three-dimensional pattern), even of high quality, are not the best option to finish the kitchen. On uneven surfaces greasy kitchen dirt will settle irregularly and wash these Wallpapers will be very difficult – in the end, after a year or two the relief will be underlined with brown patina. Textile Wallpaper from cotton, linen or silk fibers, and natural bamboo Wallpaper, stems, and leaves of various herbs or rare species of wood are now becoming more and more popular. It's expensive and very effective "breathable" Wallpaper that looks great in living rooms, but the kitchen walls are very impractical. Fibers made of such materials instantly absorb all cooking odors, in addition, they deposited soot and Chad. In the manufacture of Wallpaper on the basis of paper applied a very thin layer of vinyl, which makes them more dense and gives moisture resistance and prevents the absorption of odors. These Wallpapers are inexpensive, they have a smooth and visually dense surface, look quite attractive and with careful use can not lose the view for the past 3-4 years. They can be used for cosmetic renovation of the kitchen in a rented apartment, if you love to redecorate, or plan in a few years to update the kitchen furniture, and yet expect the "temporary budget repair". However, these Wallpapers are very demanding surfaces: they are very thin, and all wall defects and irregularities in the plaster are clearly visible. However, it is possible to mitigate, choosing for not so smooth walls kitchen Wallpaper with a small "speckled" pattern. Vinyl is considered one of the most practical options of Wallpaper for the kitchen walls. This material is characterized by durability and high strength, it tolerates dampness and copes with the protection of the walls from excess moisture, is resistant to mildew formation. The vinyl coating is non-toxic and has good lightfastness. When you purchase vinyl Wallpaper we need to pay particular attention to the density of the material and to check whether the Wallpaper crease in the hand. Vinyl Wallpaper, unlike combined, can hide surface defects, while gluing them is quite simple: in the process, they do not rush and do not crumple and do not shrink. The range of vinyl Wallpaper is quite wide, which gives many opportunities for choice. For repair of the right vinyl Wallpapers both paper and non-woven. Often recommended for kitchen Wallpapers from CD-vinyl simulating leather, textiles, stone or textured plaster. Such expensive but very stylish Wallpaper good disguise defects in walls and impressive look in the interior, they are very sturdy and stable – but if you decide to stay on this version, you should choose Wallpaper with a very shallow, hardly noticeable relief. Another version of the CD-vinyl – silk-screen printing (vinyl outer layer includes natural or artificial silk yarn). In these Wallpapers silky smooth and shiny surface, deceptively delicate in appearance, but is very resistant to moisture, sunlight and mechanical stress. 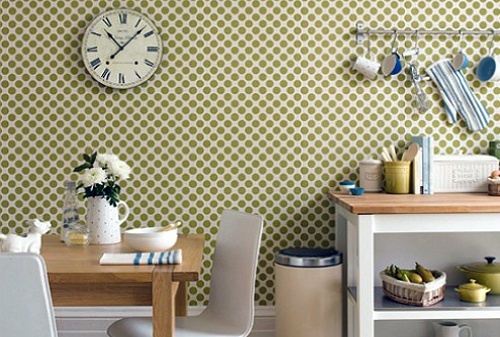 These Wallpapers can be glued in the kitchen without risking anything. But the Wallpaper from foamed vinyl (that they are often released with a specific "kitchen" drawings – images of food, utensils and accessories for cooking and so on) for kitchen walls is better not to use: they are not very durable, easily scratched and wear out quickly. Paintable Wallpaper – a quite practical option for those who like frequent changes of the interior. They also serve as a lifesaver for owners of five or six-meter dishes, which are often used to visually expand the space, but such impractical light tone. 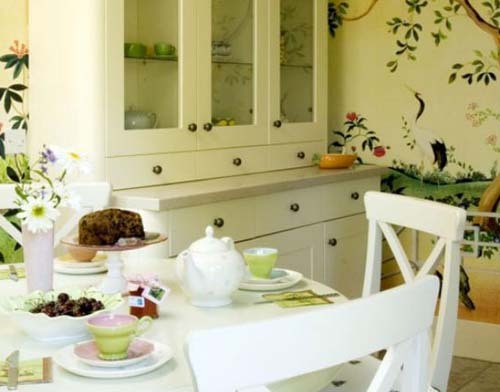 These Wallpapers are very easy to repaint, refresh, repair or changing of colour. For kitchens it is best to use non-woven Wallpaper for painting or Wallpaper made of fiberglass (fiberglass): they are much more durable than paper Wallpaper for painting, when applied did not tear or bubble, and hide the imperfections of the walls and strengthen them. Repaint they can be reused. Non-woven Wallpaper paint water-based paints, fiberglass – latex and acrylic. Fiberglass on a number of parameters are preferable – they are the most durable, fire resistant, in addition, are resistant to acids and alkalis and undemanding to care. However, these qualities made them very popular in the repair of office buildings and various "offices" in the end, not all people are willing to choose the Wallpaper for kitchen walls. Non-woven Wallpaper have a less "official" view, so many in the end prefer to use for the house.